Halvas – Χαλβάς (plural Halvades) is one of our favourite Lenten desserts, which is cooked on the stove top and then drenched in syrup. The semolina is toasted in oil or other fat until fragrant and then a simple sugar syrup is added and mixed to thicken. It is then molded and cut into pieces. Due to Lent we make it “nistisimo” which means that it does not contain any dairy, so oil is used instead of butter. The oil can be either vegetable or olive oil. The basic ingredients for Halvas are four: oil, semolina, sugar and water. The ratio is 1 (for fat) 2 (for semolina) and 3 & 4 (for sugar and water) to make the syrup. We usually flavour the syrup with cinnamon stick, cloves and lemon peel but you can add any flavouring you like. I shall try in the next few days to write some of my Lenten recipes, which were prepared on Kathara Deftera but have not managed to post them yet. I shall start with one of my favourite Lenten desserts, Halvas Katsarolas, which means Pot halva to distinguish from the one we bake in the oven. I have added my touch to this recipe by adding fruit in it but it you don’t want to add the fruit just go along with the recipe by omitting the fruit as the dosage does not change. Since Kathara Deftera I made a second one as well and again I made a different kind of halva by reducing the amount of sugar and water and adding ready-made syrup from what has remained of my bergamot spoon sweet and that gave it an extra flavour. In a sauce pan prepare syrup by adding the water, sugar, lemon peels, a few cloves and a cinnamon stick. Bring to a boil for a five minutes and then set aside. Discard the cinnamon stick, the cloves and lemon peel. Peel and cut the fruit into small pieces. Sprinkle some sugar and cinnamon and cook in the microwave for 3 minutes. (If you don’t have a microwave oven saute the fruit when toasting the almonds, without the sugar and cinnamon). In another large sauce pan, heat the oil and add the almonds and mix until they roast (light brown colour). Add the semolina and stir constantly to toast as well but not to brown. Add the fruit and stir. Remove from the heat and add the syrup. Be careful to stir constantly as this may overflow. Once the mixture has settled put it back on low heat and mix until it sets. Empty it in a mold and let it cool down before refrigerating. Unmold in a platter and sprinkle some cinnamon on top. This time I made the basic recipe which was divided in two parts. In the first one I made a strawberry coulis which part of it was mixed inside and the other served on top of the dessert. The other was made with lots of leftover ingredients I had in my cupboard such as craisins, sprinkles etc. I didn’t want to use the same mold I’ve been using for ages, so I gave it a different design by adding a smaller mold inside. Divide the mixture in two molds and add the respective ingredients. Place the first one in a mold and let it cool down before placing in the refrigerator. Unmold in a platter and decorate on top with the strawberry coulis. Wash and cut fruit into small pieces. Put the strawberries in a frying pan, as well as sugar, water and brandy. When it starts to boil, lower heat and mix continuously for about ten minutes, or until sauce is thick. Set aside to cool. Mix some of the strawberries (without the syrup) in the halvas and mix. Put the remaining stawberries with syrup in a food processor and mix to make the sauce. 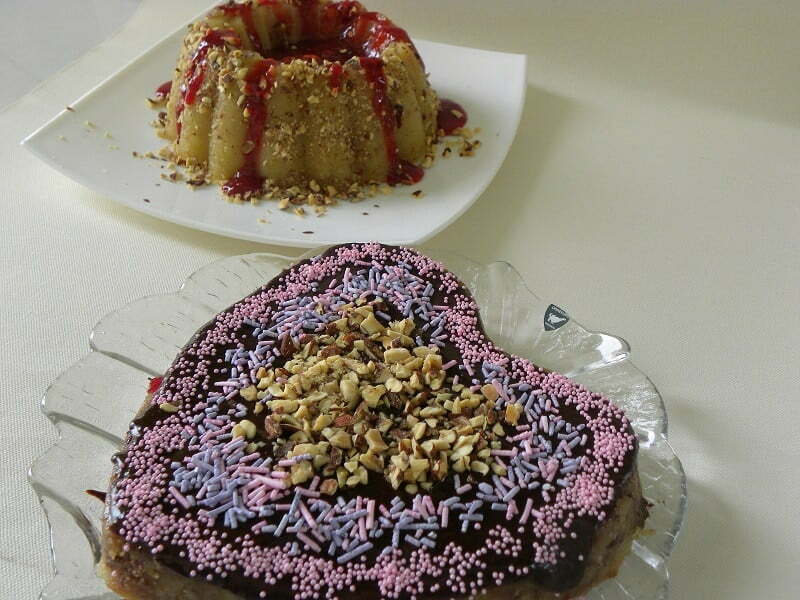 Leave it to cool down and then serve halvas with roasted almonds and strawberry coulis. Store remaining sauce in the refrigerator. Prepare halvas as above. Leave it in the pot until it becomes lukewarm and mix in 75 grams chocolate. If added while hot, the chocolate will melt. However, do add half of it while it is still warm as the melted chocolate inside is wonderful and some while it cools. I also mixed in 1/2 cup craisins (you may also add raisins) and 1/2 cup desiccated coconut. I molded it in a heart shaped pan. In a double boiler melt the chocolate and mix in the margarine and syrup. Unmold halvas and pour the chocolate on top. Decorate with roasted almonds and sprinkles. Peel and cut the fruit into small pieces. Sprinkle some sugar and cinnamon and cook in the microwave for 3 minutes. (If you don't have a microwave oven saute the fruit when toasting the almonds, without the sugar and cinnamon). Ivy, this type of halva is my favourite! I love the almonds especially. Halva is one of my fave Greek desserts too but I’ve never heard of the baked version. I could eat this summer or winter. That’s the best thing about blogging. We learn from each other. I learned your okra and now you’re learning my halva. I shall make halva fournou, especially for you. hi ivy, i have no idea why you are having problems. the filo pastry post has a video, but normally i do not put videos on the post. good luck in the future when reading my posts – i have some funny stories that you should read for a laugh! sned me your eamil and I will send them personally to you! Hola sweetheart! Never heard of this dessert but must be a delish!! Thanks Maria. Shall do so. Hola Nuria. Have a great weekend as well. looks yummy, ivy, i’m craving lots of sweets today- but, that’s nothing new! Barb Michelen. I am sorry I do not want to follow your link. I tried to see your profile but there’s nothing there. I cannot trust people who do not reveal themselves. Thanks for sharing these great recipes.